Tanaka Hisaichi (Tanaka Hisakasu) was a former language officer in the United States and an instructor in the Japanese War College. He was in command of 21 Division, the Southern Expeditionary Army reserve, when war broke out. He was appointed commander of 23 Army at Canton in March 1943, remaining at this post until the general surrender. He participated in the southern prong of the Ichi-go offensive, To-go. Although Tanaka was convicted of permitting the execution of an American airman who was denied a fair trial, his death sentence was not confirmed. 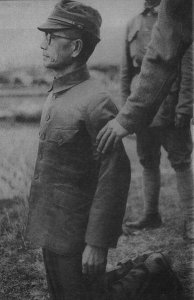 However, he was subsequently tried and executed for war crimes by the Chinese.